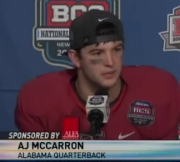 AJ McCarron made the cut to be in the top 15 for the Unitas Award. The Unitas Award, which name for Baltimore Colts Hall of Fame quarterback Johnny Unitas, is given to the college quarterback that is judged upon character, citizenship, scholastic achievement, leadership qualities, and athletic accomplishments. So far, McCarron has thrown for 999 yards, 12 touchdowns and zero interceptions so far this season. Jay Barker won the award back in 1994.